Mr Meyer said the situation in Iraq "does not look good"
A former British ambassador to the US believes the Iraq war has played a part in fuelling terror attacks in the UK. Sir Christopher Meyer told The Guardian "there is plenty of evidence" that "home-grown terrorism was partly radicalised and fuelled" by Iraq. Sir Christopher, based in Washington until 2003, said: "Don't tell me being in Iraq has nothing to do with it." 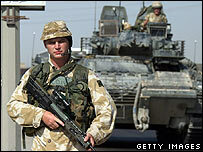 A Downing Street spokesman told the BBC that events in Iraq could never justify a resort to terrorism. Speaking to Five Live, the spokesman added that Number 10 was not in the business of issuing statements to help people sell books. Sir Christopher, who sat in on crucial meetings between President Bush and Mr Blair in the build-up to the war, is about to publish his memoirs of his time in Washington. Although he still believed that it was right to topple Saddam Hussein, he expressed misgivings about how the war's aftermath had been handled. "I don't believe the enterprise is doomed necessarily, though, God, it does not look good." Local government minister David Miliband dismissed Sir Christopher's claim. "Christopher Meyer, I think I am right in saying, is an expert on foreign policy. "He is not an expert on the domestic issues that are going on inside communities in this country," he told BBC Radio 4 Today programme. The BBC's political correspondent, Norman Smith, said that such comments, coming from an insider so entwined in the decision-making process, were "fairly damning" for the prime minister. Before his DC posting, from 1997 to 2003, he had worked as a press secretary in Downing Street. Sir Christopher - who is now chairman of the Press Complaints Commission - also unfavourably contrasted Mr Blair with Margaret Thatcher's attention to detail, saying she took pride in knowing more detail than her officials. "That is why it was terrifying to be summoned into her presence because if you did not know your stuff she would expose you," he told the Guardian. "There was never that danger with Tony Blair".